​​​​​​With the snip of a red ribbon, the City of Camden today celebrated the latest milestone in the revitalization of the important and historic neighborhood of Centerville, at a grand opening ceremony for The Branches at Centerville. The new development brings 50 modern, energy efficient, high-quality affordable rental apartment homes to a site formerly occupied by obsolete public housing. 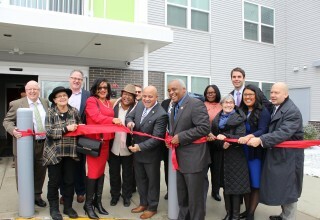 The ceremony was hosted by The Housing Authority of the City of Camden (HACC) and its private-sector partner, The Michaels Development Company, and attended by city officials, state, and federal officials as well as residents and other community stakeholders. “This is truly a great day for the City of Camden and the Centerville neighborhood, and I’m proud to say it’s just the first of many great days to come,” said HACC Executive Director Victor D. Figueroa. The $16 million three-story low-rise building is the first phase of a comprehensive redevelopment planned for the former site of Clement T. Branch Village. Featuring 44 one-bedrooms and six two-bedroom apartments affordable to households earning less than 60 percent of the area’s median income, The Branches at Centerville will accept Housing Choice Vouchers and provide project-based rental assistance to eligible residents through HUD’s Rental Assistance Demonstration program, a critical federal resource designed to help public housing agencies across the country improve and preserve affordable housing. "The Branches at Centerville is a prime example of HUD programs at work," said Lynne Patton, HUD Regional Administrator for New York and New Jersey. "In this budget constrained environment, HUD's Rental Assistance Demonstration allows Public Housing Authorities to leverage private resources to preserve affordable housing at the rate of 19 to 1," Patton said. "The Promise Zone designation, coupled with a $13.2 million Mt. Ephraim Choice Neighborhood Implementation Grant provides support that will continue to improve the quality of life of this community and of Camden residents." Amenities at The Branches of Centerville include approximately 5,000 square feet of community space for resident services, wellness and recreation as well as quiet areas, juliet balconies, flex lounges on each floor, new flooring, common veranda spaces, and laundry rooms. The environmentally conscious design includes Energy Star-certified appliances and fixtures. A newly constructed on-site rain garden will help manage stormwater runoff at the community. “We are privileged to once again be the HACC’s development partner, working with them to transform this neighborhood and lift the lives of its residents,” said Gary Buechler, president of The Michaels Development Company. Financing for the development included $6.6 million in private equity raised from the sale of federal low income housing tax credits allocated by the New Jersey Housing and Mortgage Finance Agency as well as $3.8 million in private equity raised from state tax credits allocated by the NJ Economic Development Authority through its Economic Redevelopment and Growth program. The Housing Authority provided $2.3 million in Replacement Housing Factor Funds and Capital funding. TD Bank invested in both the federal and state tax credits, which were syndicated by Riverside Capital. TD Bank also provided a $9.6 million tax-exempt construction loan. Cinnaire Investment Corporation provided a permanent mortgage loan of $1.65 million. Philadelphia-based WRT served as the master Architect and Marlton, NJ-based Prestige Building Company was the general contractor. Interstate Realty Management provides property management services, ensuring that The Branches at Centerville remains a long-term asset to the community. Branch Village is already 100 percent occupied. About The Michaels Organization: Michaels Development, Interstate Realty Management, Prestige Building Company, and Riverside Capital are all independent operating companies of The Michaels Organization. 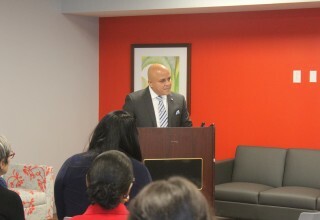 Serving more than 140,000 residents in 370 communities across 35 states, D.C., and the U.S. Virgin Islands, The Michaels Organization is a national leader in residential real estate with full-service capabilities in development, property management, finance, construction, and tax credit syndication.